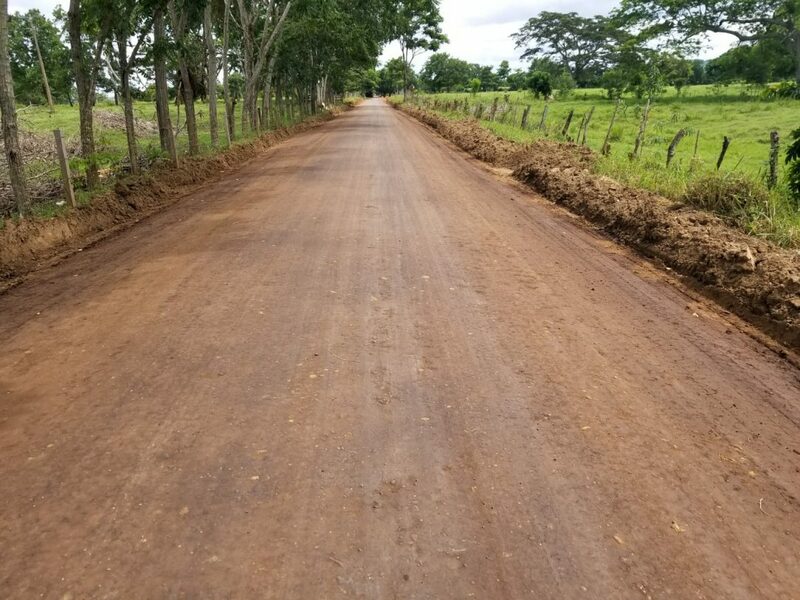 A 1 km demonstration section of road using EarthZyme and Dust Stop Municipal Blend (DSMB) was recently built near Valencia, Cordoba, Colombia in a joint project between Cypher Environmental, Roadcorp, the University of Antioquia and The Colombian Ministry of Transportation. The University of Antioquia was tasked to independently study the road for the Ministry, as well as conduct simultaneous lab analysis of how EarthZyme and DSMB impact the engineering properties of the materials in the road. Other government entities in Colombia that are stakeholders in this project include INVIAS (The National Roads Institute) and the State Government of Cordoba, who generously provided the equipment for this project. It was also supported by COOVICOM, and Alcaldia de Valencia, who produced a great video during the construction process, that can be viewed below. This study is being conducted to investigate new techniques and technologies to assist with the better construction and stabilization of secondary unpaved roads in Colombia, which are estimated to number over 150,000 km in the entire country. With predominantly clay based soils present in Colombia and making up the majority of these roads, EarthZyme and DSMB were included in the study due to their ability to stabilize clay based soils. Ultimately providing for significant potential long term operational cost savings on the maintenance of the stabilized roads, primarily due to the reduced need for repair after the heavy rains abundant in all areas of Colombia. It was also required that any new technologies approved to take part in this study be environmentally friendly, above and beyond their capabilities to enhance the engineer properties of the road materials, so after careful study of EarthZyme and DSMB, both were approved to take part in the study by the entities listed above. The initial road treated in Cordoba is located in a busy agricultural sector of the province, seeing many heavy vehicles transporting cattle regularly on the road, but also serves as a vital corridor between the towns of Valencia and Villanueva, seeing over 500 motorcycle and light domestic vehicular traffic per day, on top of the heavy agricultural traffic. The university was also on hand during the construction process to take notes and study the road as it was being built, as a part of their initial reporting process for the Ministry and INVIAS. Once the road and lab study show positive results, both technologies will be approved in the Normative being jointly developed by the Ministry of Transportation and INVIAS, allowing Cypher and Roadcorp access to take part in very significant annual secondary road reconstruction and rehabilitation projects across the country. Please see the following video showing some great aerial shots of the road build, as well as interviews with representatives of Alcaldia de Valencia, COOVICOM and Roadcorp (in Spanish). We look forward to the results of this shared project and to the opportunity to help reduce the environmental footprint and operational costs with respect to the development and maintenance of the secondary road network in Colombia. A special thanks to INVIAS, the Ministry of Transportation, the University of Antioquia, COOVICOM, the Province of Cordoba, Alcaldia de Valencia and Roadcorp for their joint participation in this project! Please feel free to contact us for more details.